The first step in learning to read is to listen. If you're too tired from those late night feedings to read aloud to your baby or toddler, let them listen to stories online with us and then see below for ideas on incorporating your own reading and story time at home (once you've had a nap). While you're feeding or playing with your little one, grab a book. 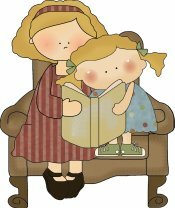 Babies and toddlers are fascinated by books, they want to look at the bright colors in the pictures, they want to touch and even taste them! Have a variety of books on hand for your little ones. Sturdy board books, cloth books, touch and feel books, and teething books are wonderful for this age group. Here are a few of our favorite book recommendations for this age group. And you can always have them listen to stories online here as well. For the first 6 months to a year you can read stories to your child while you're giving them a bottle, rocking them, or putting them to bed. When they are able, let them hold a book while you're changing their diaper (it's a wonderful distraction technique). At this age, they just want to hear your voice. From ages 1 - 3 years these little ones are getting very busy! Their attention span is very short - there is a huge world out there that they want to know everything about so they are always on the go! You can let them listen to stories online while they're on the go - this reinforces what you're doing when you read to them. They may bring you a book to read to them but not let you get the first page read before they are off again! That's okay! At this age, let them hold the book if they want, let them turn the pages as fast as they want. Ask simple questions about the pictures as they zoom through the pages. If they stop on a page with a cow say, "That's a cow. A cow says Moooooo." But don't get frustrated if they skip the next four pages. They are modeling you, they want to sit with a book and turn the pages like they see you doing. Don't make your child sit and read the whole book if they get distracted. Make it fun while they're interested. A great time for read aloud at this age is right before a nap, or just after they wake up from a nap, take advantage of those cuddle times and listen with us online!